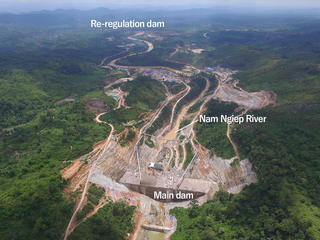 The Nam Ngiep I Dam is a 290-MW hydropower facility which epitomizes the type of infrastructure project that the Asian Development Bank ensured would have pulled Lao PDR out of poverty. Located on Nam Ngiep River in the central provinces of Bolikhamxay and Xaisomboun, Nam Ngiep I Dam is a 290-megawatt hydropower facility which epitomizes the type of infrastructure project that the Asian Development Bank (ADB) ensured would have pulled Laos out of poverty, but which ultimately came at an extremely heavy local, environmental and social cost. Construction began in 2014 after the decision by the ADB to approve a USD 144 million private sector loan for Nam Ngiep I Power Company. Japan's Bank for International Cooperation (JBIC) also confirmed project financing equivalent to USD 197 million. Notwithstanding, despite the promises of being a project that would have “[contributed] to the country's economic growth”, negative impacts on local communites where clear right before its implementation. It has been estimated, in fact, that 3,540 people from 528 households would have been directly impacted by total relocation, while 1,706 people would have lost productive lands at the upper reservoir and Houay Soup Resettlement site. A situation which starkly contrasts with the Environmental, Indigenous Peoples' and Involuntary Resettlement Safeguard Standards promoted by the same ADB, main supporter and funder of the project, which require that affected people are meaningfully consulted in culturally appropriate ways and in an atmosphere free of coercion. According to an International Rivers’ field research in 23 of the villages to be affected by the project “all villagers interviewed said that during meetings, they understood a decision was already taken by the government for the project to proceed and that they were not in a position to withhold their consent for the project or question the proposal to build it”. Villagers explained that because government officials often support large hydroelectric projects like Nam Ngiep I, which meant that raising concerns and complaints could lead to them being considered “nuisances” and jeopardize their security. In addition, villagers said they did not clearly understand the project effects and were concerned about the pending loss of land, decreases in the fish populations, and river changes. The resulting deterioration of water quality downstream, which is yet to be comprehensively assessed, could also be devastating for communities that rely on the water for drinking, cooking and bathing. Many Environmental Organizations, including International Rivers and Mekong Watch, in many occasions urged for the project to be stopped. The impacts that Nam Ngiep I will imply for the ecosystem of the area are equally alarming. At least seven endangered/endemic terrestrial and aquatic species have been identified as being both directly and indirectly affected in the watershed. This would mainly be a consequence of changes in downstream water quality and hydrological regime, but also due to the loss of habitat for certain terrestrial and aquatic wildlife species,among which the Lao Warty Newt (Laotriton laoensis), categorized as globally endangered on the list, and the Owston’s Civet (Chrotogale owstoni), categorized as endangered. In these cases species-specific conservation plans are required to be implemented, as well as a biodiversity offset to fulfill the ADB’s safeguard policy and the concession agreement requirement of no net loss of biodiversity. However, the proposed biodiversity offset, called Nam Chouane/Nam Xang, was selected with insufficient knowledge of the existing biodiversity in the sub-catchment, with limited surveys in relation to its appropriateness, and without clear guidance on selection criteria required to achieve no net loss. Last but not least, the Nam Ngiep watershed will be exposed to significant cumulative impacts due to the presence of several logging and mining concessions. Despite these findings, the project has been approved and construction began with no insurmountable obstacle for its proponents and developers. Moreover, the absence in Laos of a clear national policy or legal framework with guidance for the attainment of no net loss and establishing biodiversity offsets, produces both inconsistent approaches among developers and in delivering biodiversity outcomes. At the current stage, it is extremely difficult, if not impossible, to successfully mitigate the project’s impacts. In parallel with the case of Nam Theun II Dam , the electricity produced by the hydroelectric facilities will not benefit the area, since 90% of it will be sold to neighboring Thailand. In this sense, therefore, also Nam Ngiep I can be considered a as cross-border land grab for energy production, in which the benefits in terms of electricity and financial revenues will be largely collected by foreign countries and international corporations, while heavy social and environmental costs will be borne by local communities. Project Details The 290 MW Nam Ngiep I Dam is being advanced by the Nam Ngiep 1 Power Company, a consortium comprised of Japan’s Kansai Electric Power Company (45%), Thailand’s EGAT International Company (30%) and the Lao Holding State Enterprise (25%). Over 90% of the power generated will be exported to Thailand. The hydroelectric facility includes a dam measuring 148 m high and 530 m along the top and two power stations of 270MW (Main plant) and 20MW (Sub plant). Over 90 per cent of the power generated will be exported to Thailand, while the remaining will be allocated to domestic consumption. The Nam Ngiep 1 Main Powerhouse, which can generate around 1,546 GWh per year, will export all its production to Thailand through a 230-kV transmission line to Nabong sub-station in Vientiane, from where it will be conveyed across the Mekong River to Thailand through a 500-kV line. Around 4,000 people, mainly ethnic groups Hmong and Khmu will be affected. Why? Explain briefly. The project is already 95% complete overall, and will be soon in operation.